An artist's rendering of the proposed new home of the UC College of Law. If approved by the Board of Trustees, UC will spend $40 million to renovate the Carl H. Lindner Hall beginning in 2019.
state-of-the-art facility in the heart of UC’s campus that more than meets the needs of a 21st century law school. The University of Cincinnati today unveiled plans for the proposed future home of the UC College of Law on the university’s Uptown campus. The plan, which would involve a sweeping $40 million renovation of Carl H. Lindner Hall, will go before the UC Board of Trustees for approval Oct. 24. If approved, work to overhaul the six-story building into a cutting-edge facility would begin in the fall of 2019, following the opening of the new Lindner College of Business building, and complete in 2021. The proposal follows a multi-year investigation into potential options for the College of Law, including a possible move to The Banks downtown, renovation of the college’s existing home or new construction. Last year, the university’s Board of Trustees authorized a $1 million design study related to constructing a new home for the college on campus. 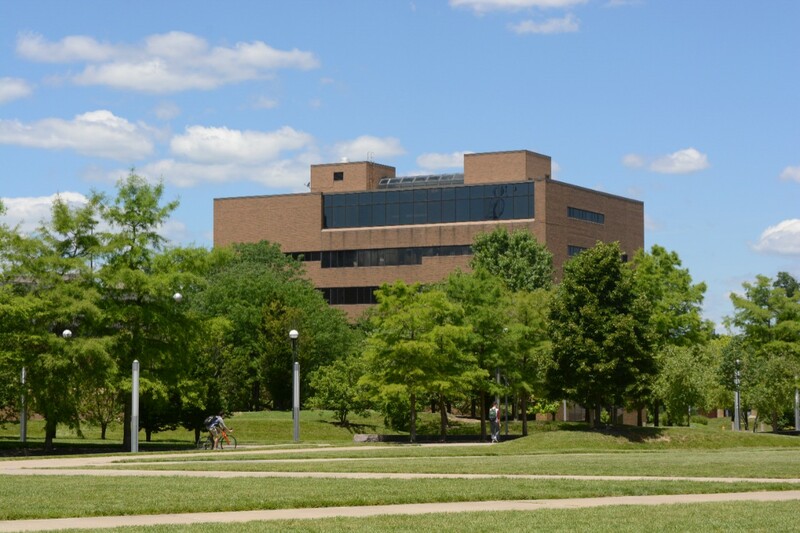 The study, which spent just $39,600 of those funds, indicated renovation of Lindner Hall to be the best option, said Mary Beth McGrew, UC architect and senior associate vice president of planning, design and construction. An artist's rendering of the proposed new UC College of Law home includes plenty of office space for faculty and staff, along with meetings rooms and areas for students. The $40 million renovation of Lindner Hall would enlarge classrooms and include state-of-the-art technology. 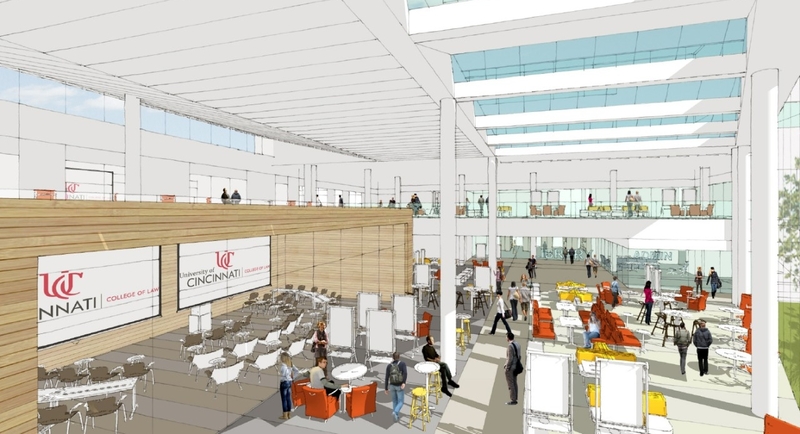 The renovation will completely transform Lindner Hall, which was built in 1986 several years before UC embarked on an ambitious master plan to transform its campus. Designed then to accommodate 1,800 students, the 84,443-square-foot facility offers more than ample space for the College of Law’s close-knit community of fewer than 400 students. Plans call to retain the building’s brick façade, but replace its tinted windows with clear glass to allow for more natural light. Classrooms will be enlarged, with spaces carved out for faculty and students to gather and study, a large auditorium to host community events, law library and plenty of office space for faculty and staff. The new location will allow for shared classrooms to better promote interdisciplinary studies and degree programs with the nearby College of Engineering and Applied Science, Lindner College of Business and UC’s medical campus, among others. All of the building’s mechanical and electrical systems will be replaced, with the goal of earning Leadership in Energy and Environmental Design (LEED) certification, a point-based rating system for evaluating new construction developed by the U.S. Green Building Council. Since 2004, UC has completed six LEED-certified buildings. A glass-enclosed addition would also be built, offering an expansive, high-ceilinged space for students and student organizations to meet, gather and study. 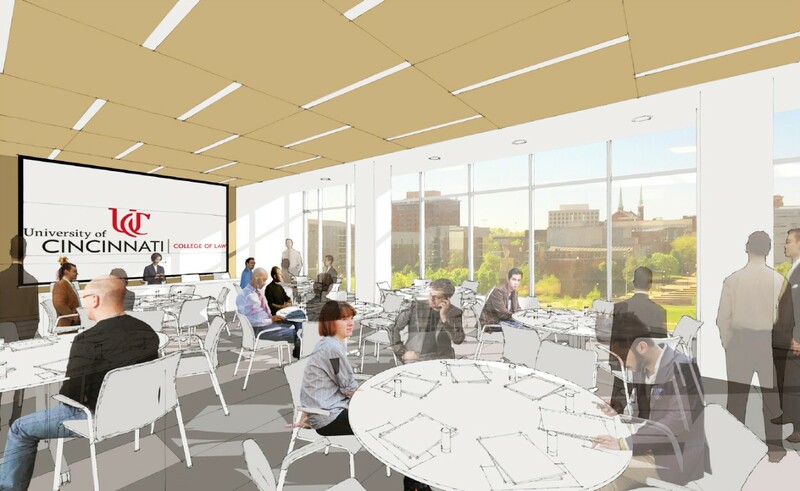 A new high-ceilinged addition to Lindner Hall would provide a bright and airy space for the UC Law community to meet, gather and study. Williams said the building’s location along Martin Luther King Drive offers the college a myriad of advantages, including the ability for students to work with professionals in other disciplines, heightened visibility and better access to parking. The new home will also better promote student enrollment for the college, which broke records last fall with its largest first-year enrollment since 2010. The college, ranked among the top 50 public law schools in the nation, is widely acclaimed for its affordability, employment outcomes and specialty programs. The proposed $40 million renovation of Lindner Hall for the UC College of Law would see expanded classrooms. 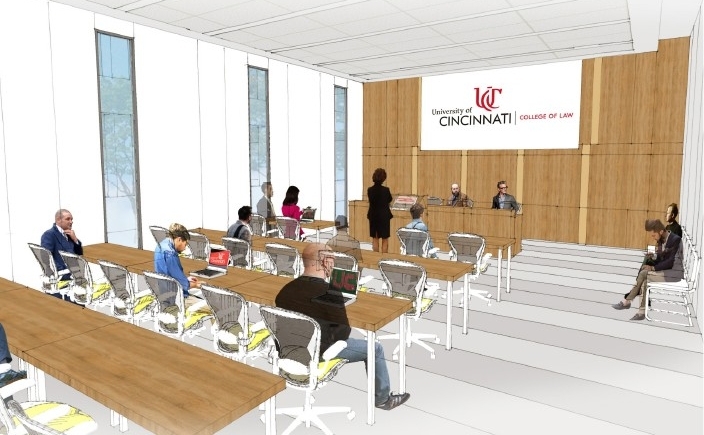 UC College of Law students will find ample space to meet, gather and hold events in the proposed $40 million renovation of Lindner Hall. 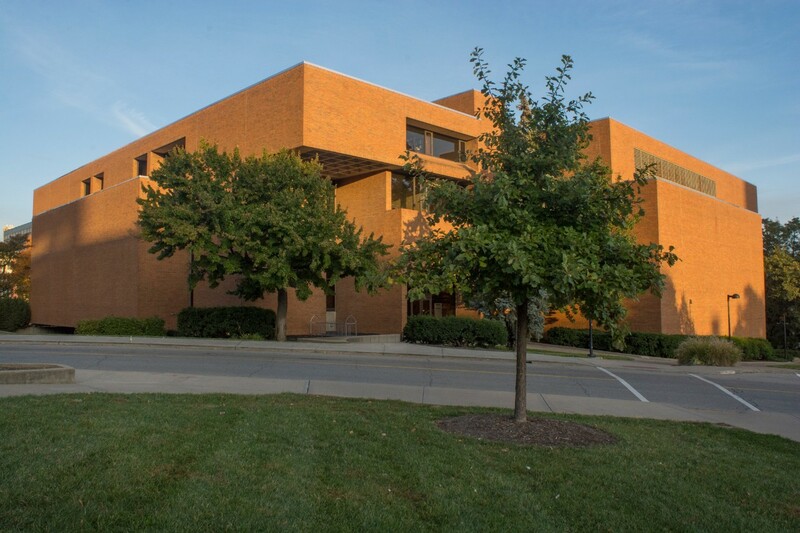 For several years the College of Law has discussed the possibility of renovating or building a new structure to replace its current structure on Clifton Ave., originally constructed in 1925 with additions in the 1960s and 1980s. Renovation of the nearly century-old facility simply isn’t feasible due to its age and structure, which include differing floor heights, construction types and layouts, said McGrew. If approved by the UC Board of Trustees, McGrew said the university plans to line up a design firm by 2018, with an 18-month construction set to begin in the fall of 2019. The university continues to study the future of the Calhoun Corridor, which includes the existing College of Law building, as part of a campus-wide master-planning process. As the fourth oldest continuously operating law school in the country, UC’s College of Law has a rich history of educating and inspiring leaders who pursue justice and advance the role of law in society. Its ranks include many distinguished alumni, including a U.S. president, a Nobel Peace Prize winner and six governors. The College cultivates an intimate learning experience with a9:1 student to faculty ratio and offers a wealth of resources, such as more than 40 student organizations, five journals and seven centers and institutes. For more information, please visit www.law.uc.edu .